"During my classes, I'll have my stu­dents disable their guns by plugging the barrel of their pistol in such a way so the gun cannot physically chamber a round. Afterward, I walk in front of the line so I can see how they present their gun from both Ready position and the holster, because this angle just gives me a better view of the physical process. I correct them as necessary. I also want them to get used to con­fronting a live killer at the end of their gun. Approximately 25 percent of stu­dents won't do it. I know the gun can't fire because I render it inoperable, but they still refuse to point the gun in my direction. Even after I tell them it's okay and they aren't violating any safety rules, they still refuse. Once the drill is over, they tell me they'll point the gun at a "real bad guy" when the time comes—but will they really?" I'd never really thought about this before, and I suddenly realized how hard it would be for me to break that unbreakable commandment: Never point a gun at anything you are not willing to destroy. Sure, in the course of my work I've pointed guns obliquely at a camera, but I've never pointed a gun at a real live person. Could I do it in the training scenario Dave describes above? Maybe, probably. What about you? 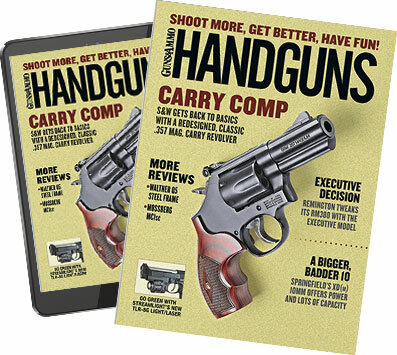 Would you be able to overcome your gun safety training—in a controlled, professional training setting—in order to improve your combat pistol readiness?